The stay on the dock parking area is allowed for a maximum of 15 minutes and it is reserved exclusively to the owner of the relative authorization released at the payment of the rate at the two Check Point or at the moment of the reservation. The authorization has to be displayed prominently on the vehicle windscreen. 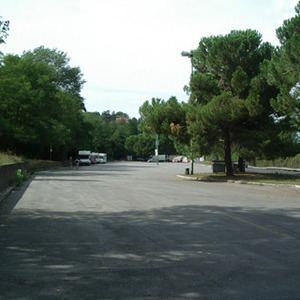 Situated inside the public car park colled “Campino di San Prospero” just before the “Fortezza Medicea”, close to the “Stadio – Fortezza” vehicle parking area,convenient to reach quickly “Piazza del Campo”. Situated in “Piazza Giovanni Amendola”, by the “Antiporto” and in front of the mechanized escalator, which leads at the Train Station. This is the perfect docking area for visiting the Northern area of the City Centre entering from “Porta Camollia” distant few hundred meters away. 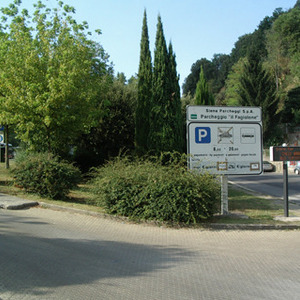 Situated in “Piazzale Biringucci”, just outside “Porta San Marco”, easily reachable from “Siena Ovest” beltway exit. This is the best docking area for visiting the Western area of the City Center of Siena. From here, by walk, you can reach “Piazza Duomo” with its Cathedral and the “Spedale Santa Maria della Scala”, today exhibition center and museum. The walking, however, may be demanding for the difference in height between “Porta San Marco” and “Piazza Duomo”. Situated inside the City walls, crossing “Porta Romana”. This is a perfect docking for visiting the Southern area of the City Center. With a relaxed walk of ten minutes, going through “Via Pantaneto”, you can reach“Piazza del Mercato” and “Piazza del Campo”. Situated in the top side of “Pescaia”, not far from the Inner City, which is reachable with a 20 minutes’ walk, you will end in “Via Cesare Battisti” near by the “Fortezza Medicea”, on the “Campino di San Prospero” side. This way is not suitable for those who may present forms of disabilities.